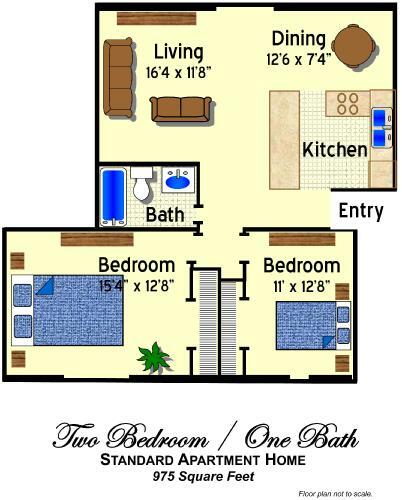 Our two bedroom, one bathroom floorplan offers a unique combination of spaciousness and privacy. The large kitchen is equipped with refrigerator, stove, dishwasher and breakfast bar. The dining area, just off the kitchen, is open to the living room and spacious enough for a full size dining table. The centrally located bathroom is convenient to both residents and guests. With one private patio off the living room, and another off the master, the outdoor living in this unit is just as important as the indoor. The plush carpet, oversized closets, and custom lighting add to the custom feel of this apartment home. Between the park like setting, two luxurious pools, and beautiful Halifax River, no matter where you are, you’re merely steps away from a serene setting! Select units have upgraded features such as: stainless steel look appliances, ceramic tile flooring and other upgraded amenities! Address: 1025 S Beach St.
Disclaimer: Prices listed are subject to change based on resident(s) desires. Must qualify, 12 month leases available (flexible lease terms available upon renewal only). Move-in costs vary, call property for specific pricing to suit your needs! Hurry while they last!